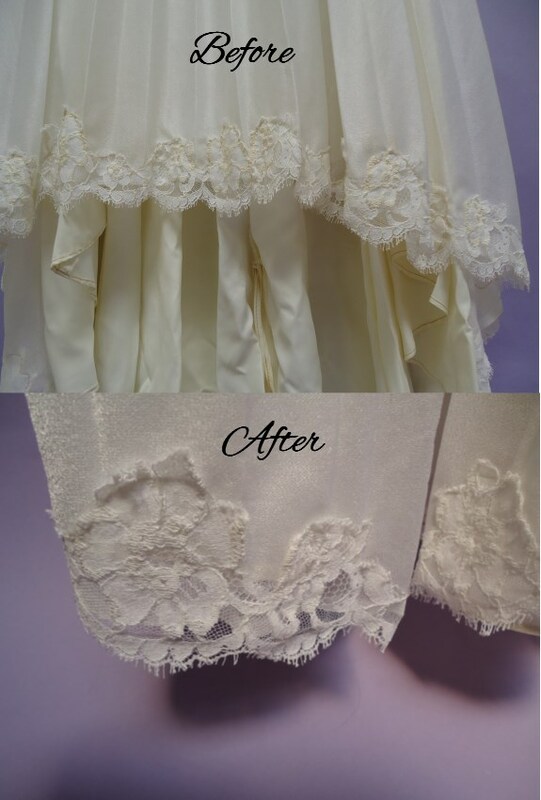 Barbara’s dress was in need of a good wedding gown restoration! Her beautiful, white lace and pleated dress had turned yellow; The threads all along the dress had become very yellow and there were oxidized stains on the back. Even the veil was stained! The only part of the dress that was still in great condition was the buttons. We removed the buttons, to protect them from the strong whitening chemicals. We separated the veil’s tulle from the headpiece and spot cleaned the yellow areas along the dress and veil. The dress now looks beautiful. 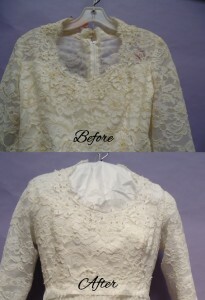 The lace lining around the bodice and sleeves are snow white. The pearls on the dress look beautiful against the white neckline and cuffs. 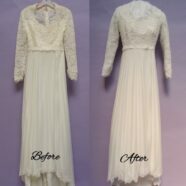 We then preserved her gown with Museum Method wedding gown preservation to keep it in the best condition possible. With just a little TLC and our Museum Method preservation, Barbara is able to admire her dress anytime and remember how perfect it was the day she wore it!